Canada having a central government (federation) is located in the North America. The country controls ten provinces, and three territories. A diverse nation Canada is replete with a rich variety of geological features, weather and eco-systems. There are rain forests in it, plain pastures, deciduous woods, tundra and wetlands. The country abounds in lakes and territorial water than any country in the world. Renowned for its scenic beauty that haunts a tremendous influx of tourists each year. The per-capital economy of the country rates it the second largest in the world after Australia. The history of Canadian population proper dates back to the long span of the flourishing of ‘ingenious folks’, succeeded after a quarter-millennium by a collision between those people and the European colonies wherein the time span finally marks the development of Canadian national state. By the 20th century Canada emerged as one of the world’s small group of prosperous, highly industrial, mechanized and wide-scale urbanized democracies. However, the regional constrains, ethnic hostilities, international pressure, and highly influential presence of the United States have been posing persistent threats to the countries stability and socio-cultural harmony. The original inhabitants of Canada are known as indigenous people, often First Nations or Indians. The term ‘Canada’ is a transformation of the word that meant “village”, from one of the indigenous languages. The original people evolved into rich cultural communities. These societies, even before the advent of Europeans, exhibited complex political arrangement. The Vikings abandoned the territory quite early than other Europeans who had amassed further during the 16th century and received a warm welcome for they had introduced industrial goods in exchange for furs and other regional goods — thereby giving business to local communities. Nevertheless, the Europeans gradually colonized the territory and subtly displaced the natives during the next quarter of the millennium. The process is referred to as ‘dispossession’ — a phenomenon Canadians have been facing to-date because of its legal and moral implications. The European inhabitation took place in a series of influx. The French pioneered the inhabitation, followed by the British — both the nations are considered founding settlers. The French, however, lost their possession of the territory in a war during 1760. However, a number of French national continued to thrive even afterwards. 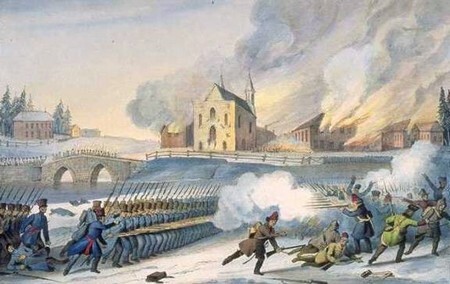 In this regard their endeavors to safeguard their culture and national identity have been shaping a history that prompts those French ethnics to seek independence from Canada. Present day Canada was developed over the course of formation of Confederation, in 1867 during which three English colonies coalesced to give rise to the independent state based on four provinces. Afterwards, six more states in addition to three territories joined the Confederation. The country attained formal sovereignty in 1931 but remains a member of the Commonwealth of Nations — an association of nations with the UK on voluntary basis.